Besphinxed is my favorite book in the Nocturne Falls Universe so far. I have enjoyed reading all of Alethea Kontis' books in the Nocturne Falls Universe--they are all fun urban fantasy / paranormal romance with young protagonists and great heroines. Kontis' books fit well together by focusing on different characters whose stories intersect while maintaining their own stand-alone integrity. So while you can read any of the books on their own, you'll get a bigger kick out of reading them all. And unlike some romance stories which lean too heavily on a formula, Kontis' Nocturne Falls books weave unique, interesting plots, focusing on characters with differing life challenges and differing world views. Now, the reason Besphinxed is my favorite (so far! ): Heather, the protagonist in this book, first appears in The Truth About Cats and Wolves as a bad gal. Think selfish and cliquish, and add in magic powers you wouldn't trust someone like that to have. In Besphinxed we meet Heather and follow along as her life snowballs into an opportunity for personal growth. As we learn more about Heather, Alethea Kontis portrays Heather's dysfunctional family in a succinctly accurate way alongside more positive relationships surrounding Heather. 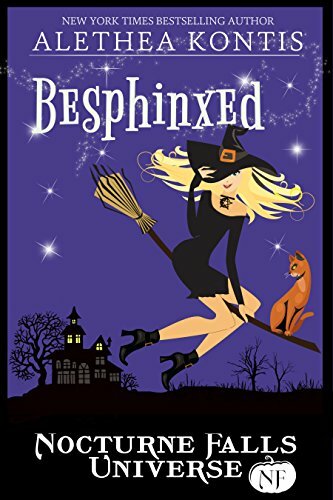 Besphinxed has real depth without losing the fun; We also get to learn more about Owen, the cat-shifter that's supposed to be the best friend of Heather's sworn enemy, but who finds himself inexplicably attracted to her. And let's not forget the Zombie Prom and a deadly magic confrontation at the end. Pick up Besphinxed for a touching paranormal romance. I cried at the end!